Easy Motion Electric Bikes – Search, Social & Display. | ASTRALCOM - Content Strategy, Conversion Marketing and Customer Acquisition. 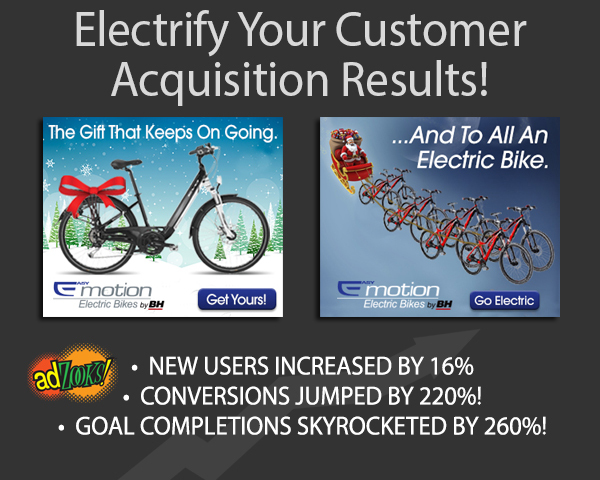 Easy Motion Electric Bikes – Search, Social & Display. | ASTRALCOM – Content Strategy, Conversion Marketing and Customer Acquisition. • Conversions jumped by 220%! • Goal completions skyrocketed by 260%! Needless to say, Easy Motion Bikes was impressed. In fact, so impressed that they renewed our agreement. Read more about this campaign in this post. Then contact us to discuss a multichannel initiative that will deliver similar outstanding results for your business.